The dog days of August see fit to grant us one more box office hit before we get into the drudgery of early fall releases. In a twist, this isn't the film that's an adaptation of some pre-existing material, and is at least somewhat original. I mean, not too original - let's not get carried away here - but “original for Hollywood in 2015” original. You know what I mean. It certainly says something about the march of time and culture that a rap group once viewed by the establishment as a dangerous menace and just shy of a criminal organization can get a bog-standard musical biopic of its very own, premiering in over 3,000 venues. Straight Outta Compton tells the origins of N.W.A. (most notably Ice Cube, Dr. Dre and Eazy-E) and their rise from street hustlers to multi-platinum selling artists and icons of industry. Directed by F. Gary Gray, it's a pretty straight run-through of the history of the group, as they rise in an environment left scarred by crime and drugs, and brutalized by police overreach. The film seems to be a lot more interested in the inter-group rivalries and conflicts than any larger social issues, which is more the shame in the long run but probably makes for (irony alert) a less controversial sell of the film. But then, with Cube, Dre and Eazy-E's family taking the producer reins, that approach is probably not too surprising. The main players in the film are portrayed by relative newcomers – Corey Hawkins as Dre, Jason Mitchell as Eazy-E and O'Shea Jackson Jr. as Cube, who you might recognize now as Ice Cube's son. Despite these lesser names in the crucial roles, acting performances seem to be at least not a hindrance to the film. Paul Giamatti, as the band's long-time manager Jerry Heller, lends some acting heft as well as a source of friction, along with R. Marcos Taylor as legendary producer Suge Knight. The real draw of the film is, however, the “live” performances and seeing how the band became what it was, coming from virtually nothing. N.W.A. Probably qualifies as the “soundtrack of a generation” for many, and while they spoke mostly about racial issues, they've transcended that with their audience, and this film should have a pretty wide appeal, both for nostalgia and soundtrack reasons. I'd look for an easy win on the weekend with about $41 million. 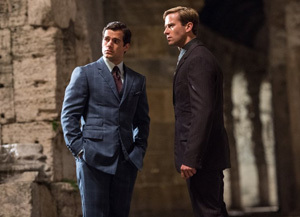 Perhaps the most surprising thing about The Man From U.N.C.L.E., this weekend's other big release, is that it's taken this long to come to the big screen, and that it hadn't been swept up in any of the previous waves of remakes, adaptations and reboots that have pulled in just about every TV series you could think of (Car 54, Where Are You?, anyone?). Directed by Guy Ritchie, this '60s spy series stays in the '60s as a period piece, centering around the title agency, which is a joint cooperation between American and Russian agencies to battle bigger foes. Henry Cavill plays the American agent Napoleon Solo, teamed with Armie Hammer's agent Illya Kuryakin to take down a sinister organization bent on destabilizing the world by spreading nuclear weapons everywhere.